دهقانی, محمد هادی, فدایی, عبدالمجید. (1393). بررسی کارایی فرایند نانو ذرات اکسید روی و فرابنفش برای حذف آفت‌کش دیازینون از محیط‌های آبی. مجله آب و فاضلاب, 26(1), 12-18. محمد هادی دهقانی; عبدالمجید فدایی. "بررسی کارایی فرایند نانو ذرات اکسید روی و فرابنفش برای حذف آفت‌کش دیازینون از محیط‌های آبی". مجله آب و فاضلاب, 26, 1, 1393, 12-18. دهقانی, محمد هادی, فدایی, عبدالمجید. (1393). 'بررسی کارایی فرایند نانو ذرات اکسید روی و فرابنفش برای حذف آفت‌کش دیازینون از محیط‌های آبی', مجله آب و فاضلاب, 26(1), pp. 12-18. دهقانی, محمد هادی, فدایی, عبدالمجید. بررسی کارایی فرایند نانو ذرات اکسید روی و فرابنفش برای حذف آفت‌کش دیازینون از محیط‌های آبی. مجله آب و فاضلاب, 1393; 26(1): 12-18. وجود آلاینده‌های آلی مقاوم مانند آفت‌کش‌ها در منابع آب‌های سطحی، زیرزمینی و آب شرب و ناتوانی فرایندهای متداول تصفیه آب در حذف این آلاینده‌ها، منجر به طراحی فرایندهای اکسیداسیون پیشرفته شده است. پژوهش حاضر با هدف حذف آفت‌کش دیازینون از محیط‌های آبی با فرایند نانو ذرات اکسید روی و فرابنفش انجام شد. در این مطالعه حذف آفت‌کش دیازینون با غلظت‌های 100 و 500 میکروگرم در لیتر در حضور نانو ذرات اکسید روی با قطر 6 تا 12 نانومتر و غلظت‌های 50، 100 و 150میلی‌گرم در لیتر و لامپ فشار متوسط 150 وات در پنج متغیر زمانی و در pH معادل 9، 7 و 3 با یک راکتور ناپیوسته انجام شد. کمترین میانگین کارایی حذف دیازینون در pH برابر 3، 49/2411/67 و بیشترین میانگین در pH برابر 7، 3/3092/80 به‌دست آمد. بهترین کارایی حذف آفت‌کش با نانو ذرات 6 تا 12 نانومتر اکسید روی در غلظت 100 میلی‌گرم در لیتر به‌دست آمد. فرایندهای نانو فتوکاتالیستی، از جمله فرایندهای پاک و دوستدار محیط ‌زیست هستند که امروزه می‌توان از آنها در مقیاس وسیع استفاده کرد. The presence of persistent organic pollutants and toxics (e.g., pesticides) in ground, surface, and drinking water resources combined with the inability of conventional treatment methods to remove these pollutants have led to the development of advanced oxidation processes. Nowadays, nanophotocatalyst processes are considered as clean and environmentally-friendly treatment methods that can be extensively used for removing contaminants. The objective of the present study was to determine the efficiency of the ultraviolet and zinc oxide (UV/ZnO) process in the removal of diazinon pesticide from aqueous solutions. For the purposes of this study, samples were adjusted in a batch reactor at five different detention times. The pH levels used were 3, 7, and 9. Irradiation was performed using a 125 W medium-pressure mercury lamp. The diazinon concentrations of the samples were 100 and 500 µg/L and the concentrations of zinc oxide nanoparticles were 50, 100, and 150 mg/L. The highest degradation efficiency was observed at pH 7 (mean = 80.92 30.3), while the lowest was observed for pH 3 (mean 67.11 24.49). Results showed that the optimal concentration of nanoparticles (6-12 nm) was 100 mg L-1. 1. Daneshvar, N., Hejazi, M.J., Rangarangy, B., and Khataee, A.R. (2008). “Photocatalytic degradation of an organophosphorus pesticide phosalone in aqueous spensions,titanium dioxide.” J. Environ. Sci. Health, 39(2), 285-296. 2. Zang, Y., and Pagilla, K. (2010). “Treatment of malathion pesticide waste water with nanofiltration and photo – fenton oxidation.” J. of Desalination, 263 (1-3), 36-44. 3. 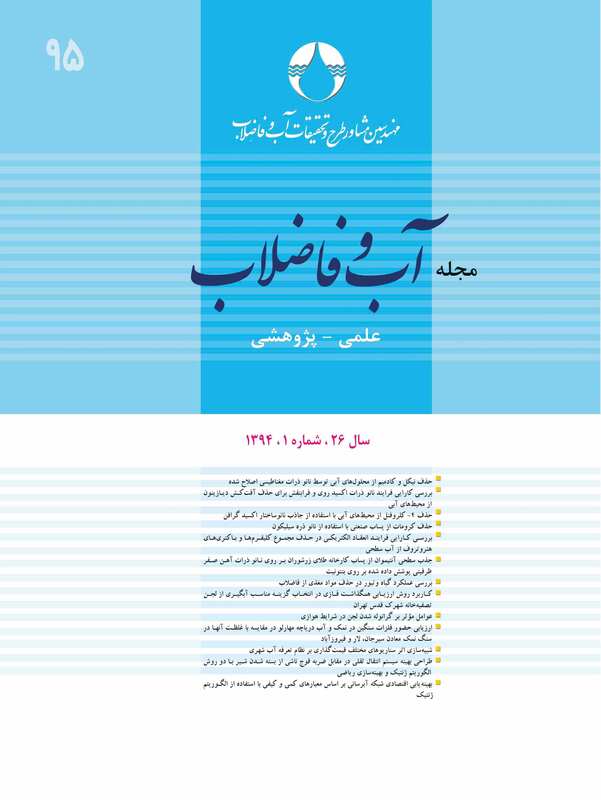 Fadaei, A.M., Dehghani, M. H., Nasseri, S., Mahvi, A.H., Rastkari, N., and Shayeghi, M. (2012). “Organophosphorous pesticides in surface water of Iran.” Bull. Environ. Contam. Toxicol, 88 (6), 867-869. 4. Oller, I., Malato, S., and Sanchez-perez, J.A. (2011).“Combination of advanced oxidation processes and biological treatment for wastewater decontamination: A review.” Sci. Total Environ., 407(20), 4141-4166. 5. Foo, K.Y., and Hameed, B.H. (2010).“Detoxification of pesticide waste via activated carbon adsorption process.” J. Hazard. Mater,175 (1-3), 1-11. 6. Ahmed, S., Rasul, M.G., Brown, R., and Hashib, M.A. (2011).“Influence of parameters on the heterogenous photocatalytic degradation of pesticide and phenolic contaminants in wastewater: A short review.” J. Environ. Manage, 92(3), 311-330. 7. Fadaei, A.M., Dehghani, M.H., Rastkari, N., Nasseri, S., Mahvi, A.H., and Shayeghi, M. (2012). “Degradation of organophosphorus pesticides in water during UV/H2O2 treatment: Role of sulphate and bicarbonate ions.” E. Journal of Chemistry, 9 (4), 2015-2022. 8. Abdennouri, M., Baaˆ lala, M., Galadi, A., El Makhfouk, M., Bensitel, M., Nohair, K., Sadiq, M., Boussaoud, A., and Barka, N. (2011). “Photocatalytic degradation of pesticides by titanium dioxide and titanium pillared purified clays.”Arab. J.Chem. (In press). 9. Daneshvar, N., Aber, S., Seyed Dorraji, M.S., Khataee, A.R., and Rasoulifard, M.H. (2007). “ Photocatalytic degradation of the insecticide diazinon in the presence of prepared nanocrystalline ZnO powders under irradiation of UV-C light.” Sep. Purif. Technol, 58, 91-98. 10. Mijin, D., Savic, M., Snezana, P., Smiljanic, A., Glavaski, O., Jovanovic, M., and Petrovic, S.A. (2009). 11. Farajzadeh, M.A., Seyedi, S.E., Shalamzari, M.S., and Bamorowat, M. (2009).“ Dispersive liquid-liquid microextraction using extraction solvent lighter than water.” J. Sep. Sci., 32(18), 3191-3200. 12. Devipriya, S., and Yesodharan, S. (2005). “Photocatalytic degradation of pesticide contaminants in water.” Sol. Energy Mater. Sol. Cells, 86(3), 309-348. 13. Pardeshi, S.K., and Patil, A.B. (2009).“Effect of morphology and crystallite size on solar photocatalytic activity of zinc oxide synthesized by solution free mechanochemical method.” J. Mol. Catal. A: Chem., 308 (1-2), 32-40. 14. Rahman. Atiqur, M., Qamra, M., Muneer, M., and Bahnemann, D. (2006). “Semiconductor mediated photocatalysed degradation of a pesticide derivative, acephate in aqueous suspensions of titanium dioxide.” J. Adv. Oxid. Technol., 9(1), 103-109. 15. Paride, K.M., Dash, S.S., and Das, D.P. (2006).“ Physico-Chemical Characterization and photocatalytic activity of zinc oxide presented by various methods.” J. Colloid Interface Sci., 298 (2), 787-793. 16. Qamar, M., and Muneer, M.A. (2009).“Comparative photocatalytic activity of titanium dioxide and zinc oxide by investigating the degradation of vanillin.” J. Desalination, 249(2), 535-540. 17. Kidak, R., and Lince, N.H. (2007).“Catalysis of advanced oxidiation reactions by ultrasound: A case study with phenol.” J. Hazard. Mater., 146 (3), 630-635. 18. Parida, K.M., and Parija, S. (2006).“Photocatalytic degradation of phenol under solar radiation using microwave irradiation zinc oxide.” Solar Energy, 80 (8), 1048-1054. 19. Shafaei, A., Nikazar, M., and Arami, M. (2010).“ Photocatalytic degradation of terephthalic acid using titania and zinc oxide photocatalytic: comparative study.” J. Desalination, 252 (1-3), 8-16. 20. Vora, J.J., Chauhan, S.K., Parmar, K.C., Vasava, S.B., Sharma, S., and Bhtadiya, L.S. (2009).“Kinetic study of application of ZnO as a photocatalyst in heterogeneous medium.” E. Journal of Chemistry, 6 (2), 531-536. 21. Lathasree, S., Nageswara Rao, A., SivaSankar, B., and Rengaraj, K. (2004).“Heterogeneous photocatalytic mineralization of phenols in aqueous solution.” J. Mol. Catal. A: Chem. 223 (1-2), 101-105. 22. Habib, M.A., Ismail, I.M.I., Mahmood, A.J., and Ullah, M.R. (2012).“ Photocatalytic decolorization of brilliant Golden yellow TiO2 and ZnO suspensions.” J. of Saudi Chemical Society, 16 (4), 423-429. 23. Shukla, P.R., Wang, S., Ang, H.M., and Tade, M.O. (2010).“Photocatalytic oxidation of phenolic compounds using zinc oxide and Sulphate radicals under artificial solar light.” Sep. Purif. Technol., 70 (3), 338-344. 24. Pare, B., Jonnalayadda, S.B., Tomar, H., Singh, P., and Bhagwat, V.W (2008). “ZnO assisted photocatalytic degradation of acridine orange in aqueous solution using visible irradiation.” J. Desalination, 232 (1-3), 80-90.